I’m a big believer in supporting new and independent brands that I love, so tonight I wanted to show you all a great little store I found online recently called Veuxdoo. If you love all things Vintage like me, then you will love all the pieces in their store, and there’s even lots of customised and modern items if those are more your thing. They specialise in re-using and re-vamping old items and give them a new lease of life with edgy customisation for today’s fashion forward females. I’ve pulled together a few of my favourite things from the current range to show you, including clothing and jewellery! Veuxdoo currently have a selection of gorgeous customised denim jackets, and number one is one od my favourites. It fits in with the whole 90s trend that is doing the rounds without being too obvious, and would be great in the summer months thrown over a cute summer dress. The pink embroidery on the back is lovely and gives it an individual look. I think my stand out piece from the whole site though is the dip dyed number with stud detailing. Perfect for adding a splash of colour to a simple look. I’d team it with a grey oversized tunic dress and Nike Blazers for a casual twist. The wolf tee and studded biker would sit perfectly together with a pair of skinnies and some chunky heels, and are so easy to dress up or down for day or night. 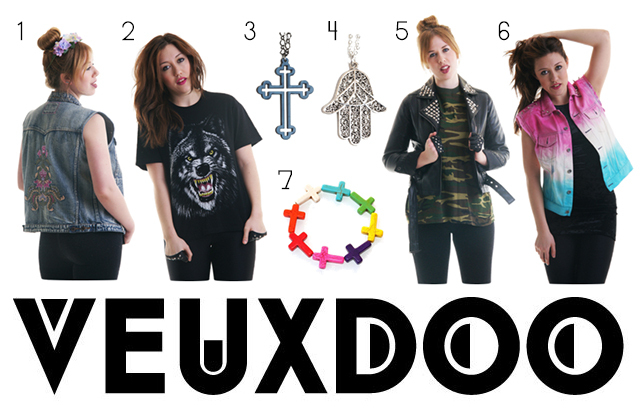 Have you shopped with Veuxdoo before? What are your favourite pieces? "MARC JACOBS: DAISY EAU SO FRESH SUNSHINE"